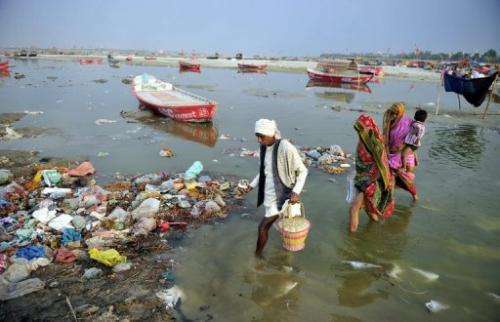 Devotees cross the polluted waters of the Ganga river to take a holy dip at Sangam in Allahabad in April. India's cities are becoming more polluted and unhealthy, according to a new survey published Monday showing growing concern about the impact of high economic growth on the environment. India's cities are becoming more polluted and unhealthy, according to a new survey published Monday showing growing concern about the impact of high economic growth on the environment. The Energy and Resources Institute (TERI) research group based in New Delhi questioned 4,039 people living in India's six biggest cities about their perceptions, opinions and awareness of the environment and green issues over the last five years. "Air quality in these six cities has become worse in the last five years or seen no change," the survey said. "Surface water quality seemed to have deteriorated in all cities apart from Mumbai (no change). Five cities saw a fall in ground water availability (excluding Chennai) and the number of trees, birds and animals saw a decline in all six cities." 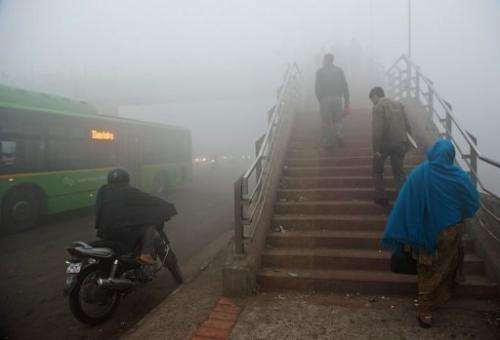 Commuters walk up a foot bridge amid smog in New Delhi in January. The Energy and Resources Institute (TERI) research group based in New Delhi questioned 4,039 people living in India's six biggest cities about their perceptions, opinions and awareness of the environment and green issues over the last five years. The survey said respondents from Bangalore, Chennai, Delhi and Hyderabad claimed a worsening of waste management in their city, while respondents from Kolkata and Mumbai saw an improvement. The survey also showed Indians were increasingly conscious of the need to reduce pollution and that governments, industry and others should strike a balance between protecting the environment and development, said TERI's Ligia Noronha. "It (the environment) will be a very important election issue. Why? Because it's beginning to hurt people at various levels, (for example) if you look at water quality and availability (and) the sheer quality of air," Noronha told a press conference. "They want the environment to be looked after." 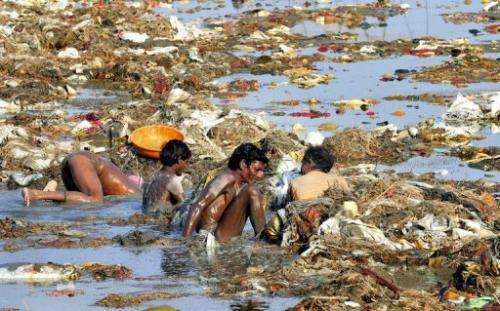 Men hunt coins and gold in the polluted Ganga river at Sangam in April after the Kumbh Mela festival. Indians are increasingly conscious of the need to reduce pollution and that governments, industry and others should strike a balance between protecting the environment and development, says a survey. Asia's third largest economy is undergoing rapid development and an urban shift as rural people flock to the cities in search of work and a better quality of life, putting a range of pressures on the environment. India has the worst air quality in the world, beating even its neighbour China, according to a survey in 2012 conducted by Yale and Columbia universities in the United States. Eighty percent of the nation's sewage is untreated and flows directly into rivers, polluting the main sources of drinking water, a study by an environmental watchdog showed in March this year.